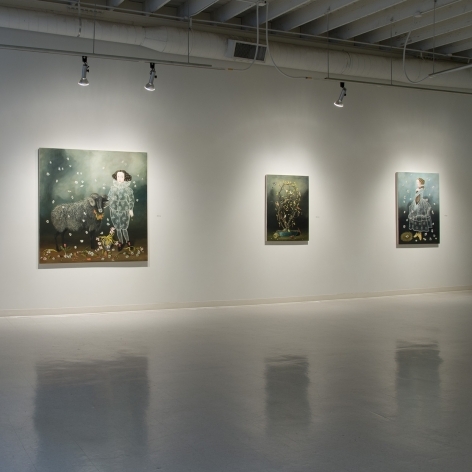 Anne Siems presents Dream Lessons, with paintings that explore the role of dreams and the unconscious in her creative process. 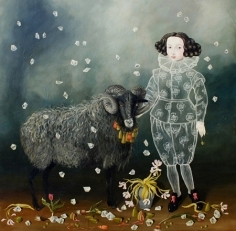 Landscapes recede and people, animals and objects move into the forefront of her work. 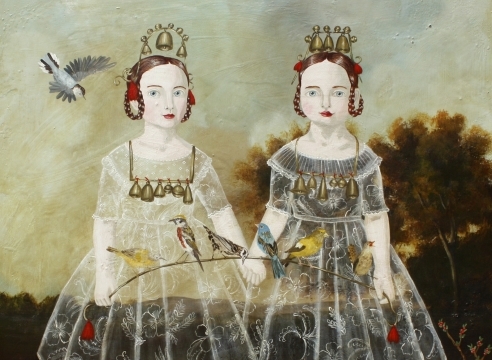 At first glance, the large-scale paintings in Anne Siems' Dream Lessons appear to be fantastical whimsy, like the illustrations of a Victorian-era children's book come to life. On one canvas, an owl perches in a fair young girl's antlers while a hare rests at her feet. In another, a woman holds a duck in her arms while eggs rain from the sky. Two artists address the figure in strikingly different ways: one via magical realism, the other with a minimalist, architectonic approach.